That’s Life Magazine Issue 2 from 13 January 2011 features the story of Lizzy who I helped overcome a life long allergy of Cats. WHAT I WAS LIKE From birth I was a sickly child, wheezy and congested, When I was four my GP discovered it was an allergic reaction to cat fur. At the time we had an Abyssinian short-hair, Phoebe. We kept her, hoping I’d outgrow my allergy. But by seven I was dependent on steroids and inhalers to help me breathe, and Phoebe had to go to a new home. If a friend invited me for tea I’d tell them: “Only if you haven’t got a cat.” And if I was going to a house where they did have a car, my chest would tighten and my anxiety increase as I neared the front door. But as long as I avoided cats I was OK. WHAT I DID At 27, I met a hypnotherapist at a do and he said he might be able to help. I was sceptical but my partner Rob said: 'What have you got to lose?' The first time I was hypnotised the therapist told me to gaze at a spot on the ceiling. I remember he spoke in a monotonous voice but I can't recall what he said. Next thing I knew I was waking as if from a lovely refreshing sleep. A few days later we visited Rob's dad. He had a cat and, to my amazement, I sat in the same room with it and felt no ill effects. In fact I didn't have any problems near cats for about six months. Then I noticed a slight tightening in my chest again so I went for a second session. A few months ago Rob and I took in a stray kitten. We called him Jammy Dodger. 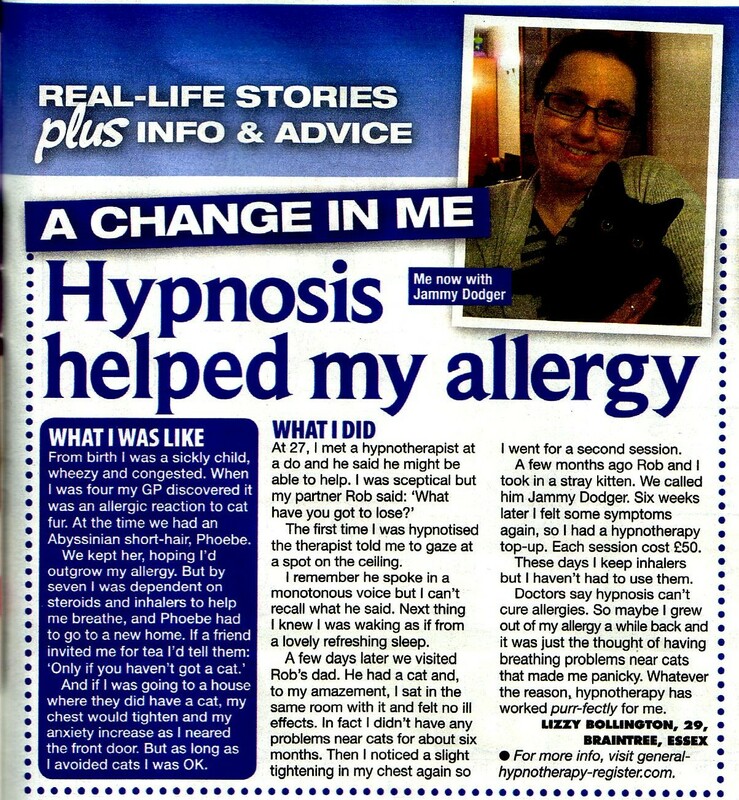 Six weeks later I felt some symptoms again, so I had a hypnotherapy top-up. Each session cost £50. These days I keep inhalers but I haven't had to use them. Doctors say hypnosis can't cure allergies. So maybe I grew out of my allergy a while back and it was just the thought of having breathing problems near cats that made me panicky. Whatever the reason, hypnotherapy has worked purr-fectly for me. After this story made the press I was contacted by another Cat Allergy suffer. They just wanted to be desensitised to their allergy and just before Chrismas another stray cat found a new home! Another cat allergy suffer discovered they could be free from their problem and so chose to have a cat of their own. So how is this happening? Did these people not have real allergies? My understanding in both cases was the allergies was real and physical. So why has a talking therapy helped them? The truthful answer is we will probably never know. During my sessions I focused their immune systems on the problem and asked it to come up with new solutions that allow the client to be healthier. I got the clients to focus on what they want. When we have a problem we normally focus on the problem itself. This is a kind of negative self hypnosis. If we repeat something enough we start to look for it and we start to see it and believe it to be real. When you look for a new car you go to a show room and see one you like. When you are driving it around you are then amazed at how many other people have bought the same model and colour. You had never noticed them before and now because it is familiar you see them everywhere. Equally if you are not sure how something is happening you start to think of possible reasons. If you think something bad happens every full moon you perhaps start to watch for it happening. If something bad happens you feel reassured that the pattern you have spotted is correct and you tend not to notice when it doesn’t. Shark attacks occur more when Ice Cream sales are high. This is a proven fact but does it mean that sharks attack people with Ice Creams? It doesn’t the link is there are more people in the sea/ocean when it is hot and hot weather increases the sales of Ice cream. In the That’s life article it is suggested that Lizzy might have grown out of the problem but not realised it. This is of course a possibility. It is very easy for us to develop a limiting belief and then see the proof that it still exists long after the problem has gone. The more I help people with Hypnosis the less important I feel the why is. In fact I often find it is the why that holds people back and once they can let go of the why and see what they want, the sooner they more forward on their issue. 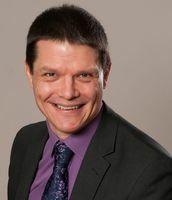 If you want help with an allergy or in any other area of your life call Jon Hinchliffe on 0800 612 6536 and discover what changes you can make in your life with his expert help. In August 2010 Let’s Talk Magazine covered my continuing ME/Chronic Fatigue Syndrome (CFS) improvements. I am still not 100% but my life has changed significantly since I started using the principles of psychotherapy and hypnotherapy on myself. I have always been a positive person, or so I thought but I didn’t realise I could be so much more positive.